I have been trying to incorporate the Word and Bible reading into the girls’ daily life (and mine—but that’s another story). Raine’s had several Bible story books over the years, and we’ve been reading those off and on, but I wanted something deeper and more meaningful. 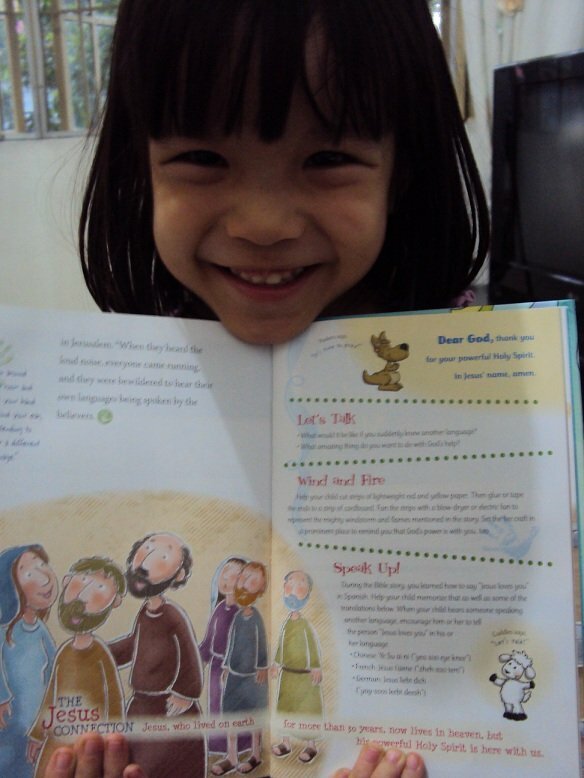 We also tried memorizing one verse a week, as part of our Sonlight homeschool curriculum, but we’ve been on school holiday for a couple of months now, since I’ve been busy with an annual magazine of mine, so we stopped that. I feel guilty not being consistent with the memory verses, and my daily Bible reading has been a struggle for me as well. Last year, however, we started a new family Christmas tradition: the Jesse Tree. I have more to share on this, complete with pictures, but for now suffice it to say that every day, we hung an ornament on the Christmas tree and read an accompanying Bible verse. We did this 26 days before Christmas, hanging the 27th ornament on December 25. Aside from just three exceptions (we came home way past the kids’ bedtimes), I’m happy to say that we were able to faithfully have a Jesse Tree reading every night, after dinner. The Jesse Tree reading has now evolved into our nightly Bible reading. 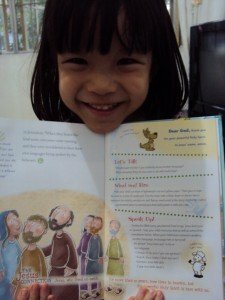 In the past, I’d try to read a Bible story for bedtime (sadly, rarely the girls’ choice for bedtime stories), and the girls weren’t too keen on it. The Jesse Tree reading has made it easier to incorporate Bible reading into their daily routine—it isn’t story time (I have to make sure I read them another story some time during the day) but Bible Story Time. I still haven’t decided on how we’ll memorize verses though, if we go for NLT or the usual NIV. But back to My First Hands-On Bible. 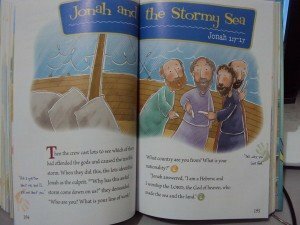 It’s written in actual, but abridged, NLT Bible text, so your children can get the gist of the story, skipping potentially confusing passages. The abridged version also keeps the reading short, so you don’t lose their attention. I like that it exposes the girls to actual Bible-speak, so when we move on to a full Bible (I already have the Hands-On Bible), it feels familiar. I also like the illustrations; they’re colorful and great for kids. Pockets the Kangaroo. At the end of each story, Pockets has a short prayer that ties in with the story. We let Raine read the prayer, so it gets her in the habit of praying on specific things, not just the routine “thank you, Lord and keep me safe” (not like there’s anything wrong with that). Cuddles the Sheep. Cuddles has suggestions for different after-reading activities that also tie in with the story. So far, we haven’t done too many of the activities, since we read right before bedtime, and some activities involve drawing, exploring, or movement that aren’t exactly conducive to sleeping, and we usually forget about the suggested activities the next day. The Jesus Connection. 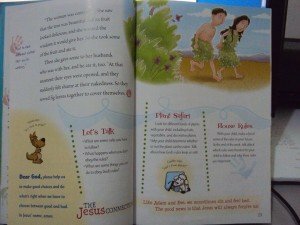 I also like how each story ends with a Jesus Connection that shows how Jesus is a part of everyday life, and that He is part of all scripture. Let’s Talk. 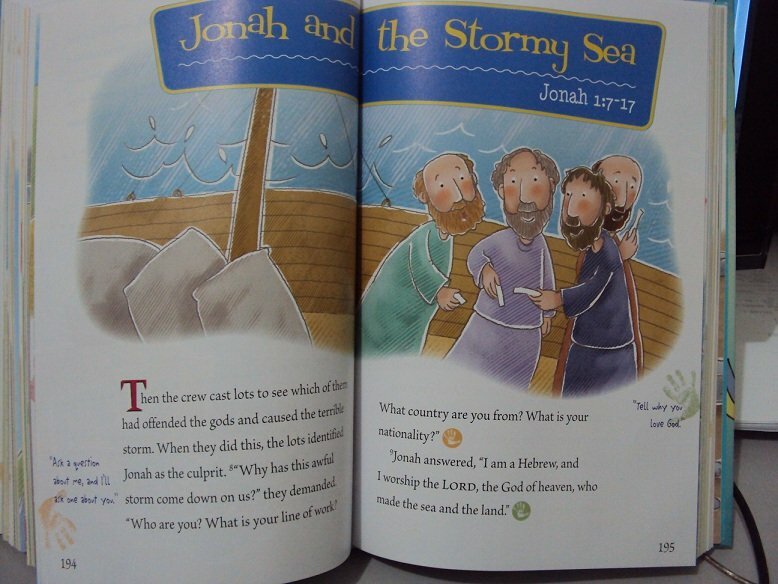 This section features questions that can lead to interesting discussions with your kids after each story. Like the question on what God made special about you (after the story on the creation of man) led to Raine asking what if she were God, and what if something were impossible for God, and what if she and Breeze were God, could there be more than one God (I don’t even know if I answered her questions adequately. I was totally unprepared for such discussions!). Activities. Throughout the stories, there are palm prints that lead to activities that you can do while reading the story (or after), like making fish faces during the story of God creating the animals, or pretending to be a snake (story of temptation). I personally find them a bit annoying sometimes, but Raine likes them. I find, though, that we could get distracted by the palm print activities and we go way off tangent from the story. We don’t do all the palm print activities. At the end of the story, there are also other suggested activities that you can do later. 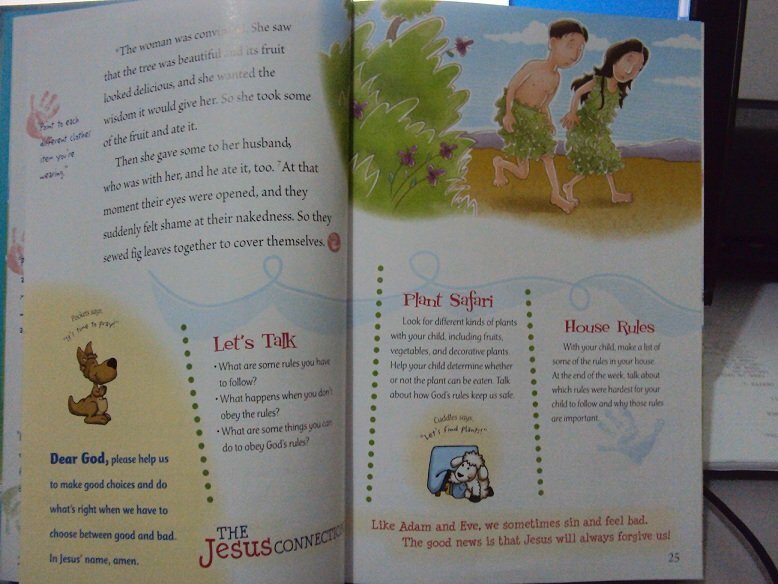 We enjoy this Bible's features, like the prayer led by Pockets the Kangaroo and the Let's Talk discussion questions. I haven’t seen the My First Hands-On Bible here, so I ordered mine from The Book Depository. I actually thought I’d get one at the Book Fair, but they only had the Hands-On Bible, a leather-bound and not hardbound one at that, but since I prepaid it, I got it and am keeping it for when Raine is ready for it (interesting to note the differences between the sisters: even before she was a year old, Raine would sit still when we would read to her, really listening; she could stay still for as long as 15 minutes. Breeze, on the other hand, will stay around for a page or two before wriggling off into something else). I’m quite happy with the My First Hands-On Bible, and I look forward to the Hands-On Bible. I’m glad that they have books like these now. They make my life so much easier. Oh, one more thing to note—they recommend the My First Hands-On Bible for 3 to 6 year olds and the Hands-On Bible for 6 year olds and older. Have you tried the Hands-On Bible or My First Hands-On Bible? How does it work for you? If not, what do you use to incorporate the scripture in your kids’ lives? Thanks, Irmee! I’m glad yo find these posts helpful. I found the Hands-On BIble here, but not the My First Hands-On Bible. Let me know if you do find it. They make great gifts. Wow–Sunday School teacher! Ang galing! 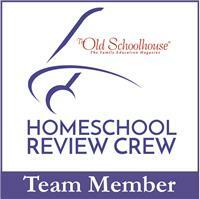 we are also a homeschooling family. i am curious how Sonlight is.. is it good? what core package did you order from them? Chris, I was blessed to have a friend who lent me their Sonlight Kinder-level core and Grade 1 reading materials. It worked well with us, since my older daughter, Raine, loves reading and being read to. It is a reading-intensive program; if you aren’t fond of reading aloud (something I had to ge used to), it may be overwhelming. 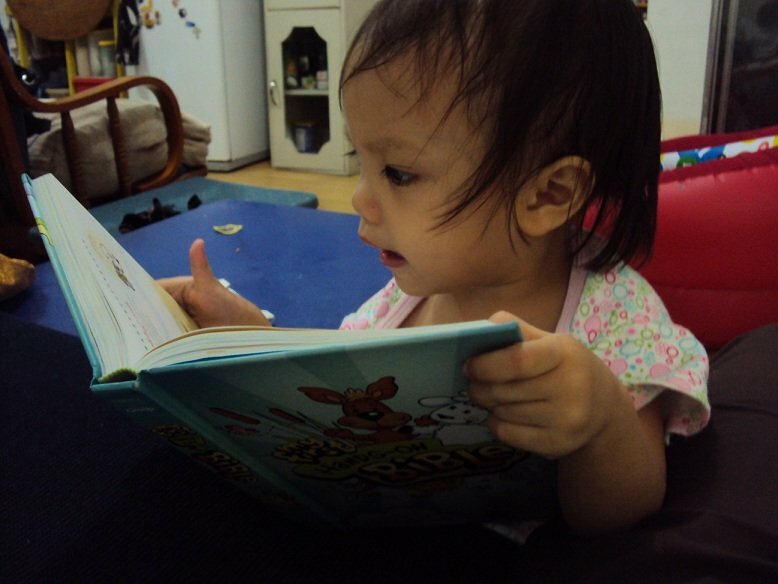 I’m not sure also how it will work out for my younger daughter, who isn’t into reading/books as much as her Ate. I love Sonlight, it really is the way I wish I had been taught. What curriculum are you using with your kids, and how old are they?